You get more with Creative Triangle: big-brand experience, small-agency work ethic, straightforward value for money. There’s no marketing jargon, just big ideas shaped to the needs of your brand and your audience. We’re easy to work with too. Not just because you’ll know us all by name, but because we’ll all know your business as if it were our own. You’ll feel like we’re all part of the same team. Our clients are as varied, colourful, and eager as we are: public and private, blue chips and start-ups. Why not give us a call? You’ll be talking to people who speak your language. 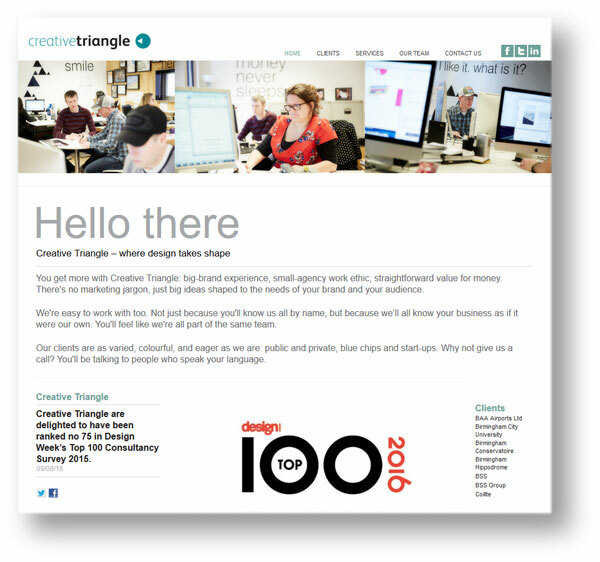 Creative Triangle is a small creative agency with plenty of clout. Clients voted them up to 4th place (for their size category) in the Drum’s 2015 design-industry poll, and they were among Design Week’s Top 100 in 2015 and 2016. Working with the Creative Triangle team is pure pleasure. They’re an unassuming, down-to-earth bunch who get on with the job. We’ve worked with them on so many projects we had no difficulty in nailing what they stood for when we wrote their home page. The strapline ‘where design takes shape’ is ours too.